The attention of the whole world is towards the South Asian center of the globe and besides terrorism, there is another reason to it- The China Pakistan Economic Corridor, more commonly known as CPEC. Here are a few interesting facts that would help you understand why everyone is so concerned about it! The world’s economic centre is shifting to South Asia because of cheap labour and lower direct costs. Though autonomy has created victims of globalization; this is also an encouraging factor for the foreign investors who will now find a new arena for industrialization. The main gamer in the economic shift is China with its “made in China” labels finding space on the simplest 10 cents toys to the most ostentatious cell phones of the world. Currently China has to take a longer sea route in order to export its products to the western side of the world. This route passes through the South China Sea and through the Straits of Malacca. From there on it enters the Arabian Sea, the Arabian Gulf and the European markets. The route carries Chinese products all the way from Shanghai and other hubs to Europe and America. With the CPEC in place, the distance that Chinese products have to cover will reduce by 12000 kilometers! The CPEC doesn’t only mean reduction in distance, but also carries auspicion for the Chinese in terms of the South China Sea. With current unrest along and around the nine dotted line of the sea, China can well explore other routes so that there is no or less possibility of trade inhibition or injunction. We must admit it that in order to become a superpower “armed conflict” is not the only means, rather it can no longer be the basis on which power is built. A nation can become a power only when it is economically self sufficient, it doesn’t increase its gearing, it pays off its loan and debt, it flourishes with respect to growth and industry and so on. China is an emerging superpower for precisely these reasons and it is a worrying situations for the policeman of the world a.k.a USA. The CPEC will improve economic prospects for 94% of Chinese land, where but only 6% of the whole population lives. The remote areas of the Xinjiang province to the west of China will see better economics as a result of CPEC. To think that China is almost ruling world trade with only 6% of its land amazes us! 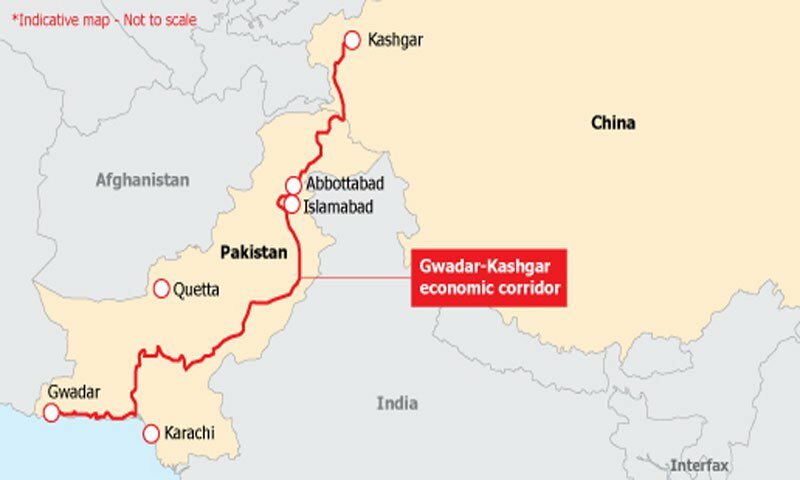 In case India goes to war with China, or vice versa, on the west border of China, it would be easier for the latter to move its forces to the border as a result of CPEC. CPEC will lead to better economic growth for the derelict province of Balochistan in Pakistan. According to many Indian opinions, Pakistan is occupying the area illegally and India must answer to the calls of independence of the people. Since CPEC passes through the area, the whole stance of illegal occupation seems to be a story under which lie economic concerns for India. The port of Dubai is one of the major trading hubs of the world. The country of UAE has shown its concerns with respect to CPEC. Yet the whole tale seeps down to one simple line “existing powers do not want another economic power”. The route of CPEC begins from Xinjiang in China and enters Pakistan at Gilgit Baltistan. It moves through KPK and enters the province of Balochistan through which the road gradually glides onto the seaport of Gwadar which is a deep sea port bringing more saving to China. They will not be needing smaller ships at the quay while the bigger ones wait in deep sea. The funniest and most ironic part? Gwadar wasn’t Pakistan’s! It was land that belonged once to the Kingdom of Oman and was sold to Pakistan for $3 million. Now Oman wallows in regret and misery as Pakistan reaps the reward.